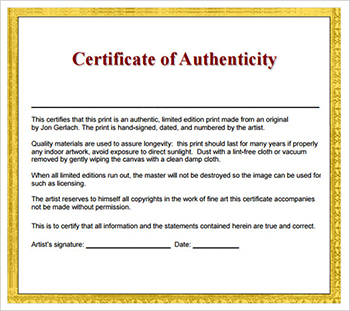 All artworks displayed on the website are supported with an ‘Authenticity Guarantee Certificate’ from the Artist / Seller. In the event that the artist is unable to sign the certificate, Gallery Kolkata will issue the same for artworks sold from the gallery. Gallery Kolkata provides an assurance that each piece of art which we offer for sale on the site is a genuine work of the artist listed. We work in the primary market, which means that we receive artworks directly from the artist. This ensures not only great quality but we know that the artworks are 100% authentic. In the event of works being sourced from collectors and other genuine & authentic sources; the artworks are thoroughly vetted by seasoned experts to ascertain the originality of the work. The artwork undergoes a complete process of research and examination before it is offered to our esteemed collectors. Often a provenance certificate is also offered along with the authenticity certificate which is especially true for non-living artists.